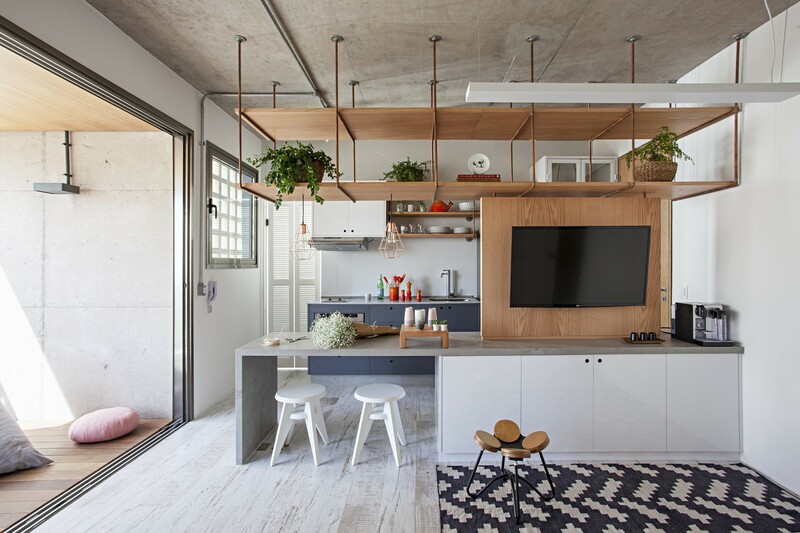 Designed by the brilliant minds at Casa100, this apartment in São Paulo, Brazil will leave you speechless. The 2 bedroom, 2 bath apartment was converted into a large master suite 1 bedroom with an equally large 1 bathroom. In case you fall in love with the look as much as I have, at the end of the post I’ve included home decor items that will help you recreate the look! The residents wanted it to be inspired by minimalism and Scandinavian design and Casa 100 delivered perfectly! I personally love the open kitchen layout that connects the living room. The use of wood and gorgeous accents makes it feel very welcoming. The gold industrial lights are the perfect blend of urban with a bit of glitz and glam. The pastels used really complement the greys and the wooden partitions. The use of rugs in the apartment, also adds a level of warmth to the room. This bookshelf is incredible right? I love the rust colored bars on the shelving frame.